When you workout, you tone and shape your muscles but it is necessary to stretch these muscles. Because if you do not, the very same muscles get tight and cause aches and pains. It is very common to see a runner having tight calf muscles and hence shin split. Similarly tennis players experience tennis elbow. People who workout a lot, lift weights, work a lot on abs, neglect back and end up having back ache. Here I am going to mention 5 common workout aches and simple easy stretches to get rid of those aches and pains. 1. As I mentioned, back pain is the most common pain. Our spine is very important and most often neglected. We always bend forward and never backward. Spinal rotation should be done. Also Cobra position or bhujangasana is very good backward bending pose. 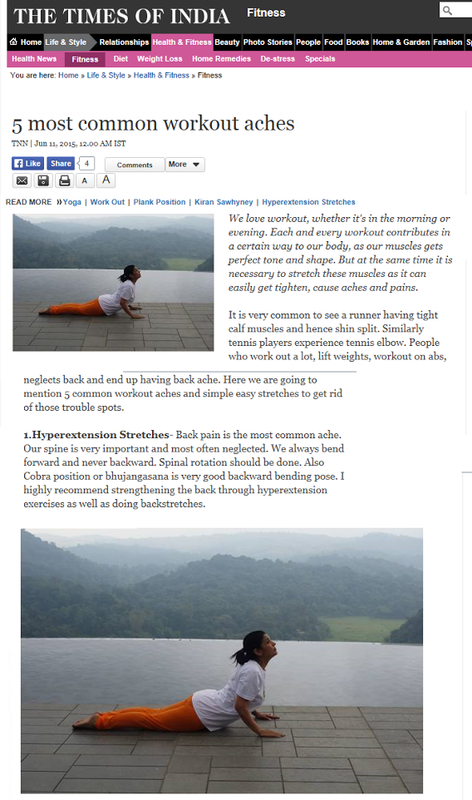 I highly recommend strengthening the back through hyperextension exercises as well as doing backstretches. Below are two good stretches. 2. In today’s busy lifestyle, we are always in a rush. We even have rush to finish our workout. There is a major mind and body connection, which people do not realise. The aches and pains are a signal to slow down a little, to look inside, and to quieten not just mind but also the body. Psychosomatic aches and pains arise because the body and mind are screaming to relax a little. 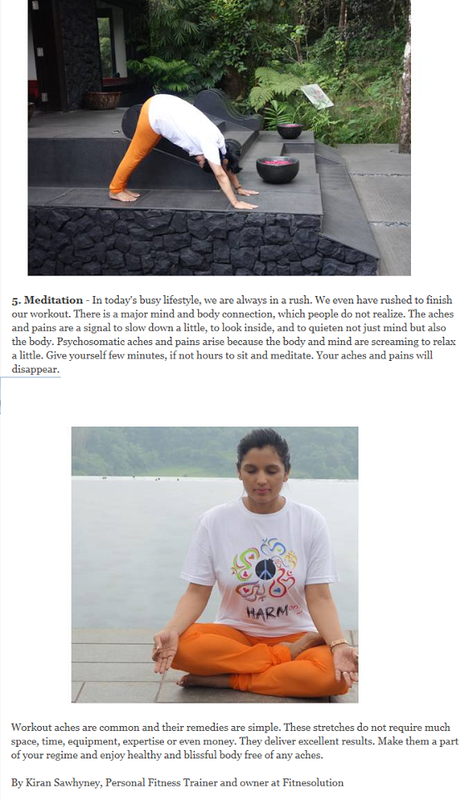 Give yourself few minutes, if not hours to sit and meditate. Your aches and pains will disappear. 3. Plank position. It is a fantastic isometric contraction for the whole body. Whether it is to stretch or strengthen, plank just works wonders. It works on abs, back, arms, shoulders, legs, completely. When you do not have time to do anything else, do a plank and hold it for about a minute. You can start slow with 10 seconds and gradually increase the hold. Plank position will also help to get rid of common aches and pains in the body. 4. Generally, the most common workout is walking/running/biking or any such activity like dancing, aerobics etc. Hamstrings are the muscles, which get tightened due to thee activities. This again leads to low backache. As tight hamstrings pull the back muscles towards themselves. Here is a good stretch for the back and hamstring muscles. 5. Last but not the least is calf muscles. These are small muscles that bear a lot of load and wear and tear. A simple stretch like downward dog or inverted V, where you carefully pace your heels on the floor, helps you to stretch your calf. It is a simple and effective stretch. Workout aches are common and their remedies are simple. These stretches do not require much space, time, equipment, expertise or even money. They deliver excellent results. Make them a part of your regime and enjoy healthy and blissful body free of any aches.